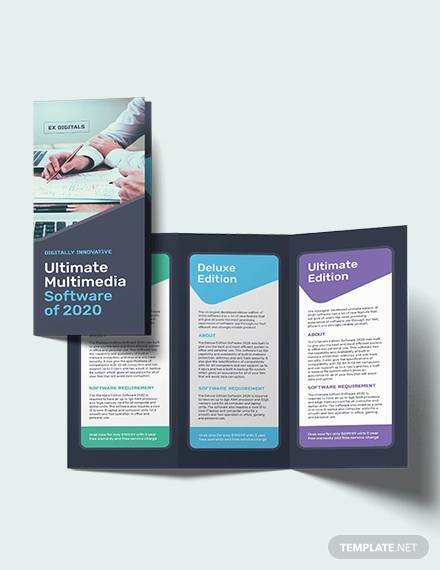 Software brochures templates are must needed tools for software companies to promote their services and products among potential customers and generate leads in plenty. 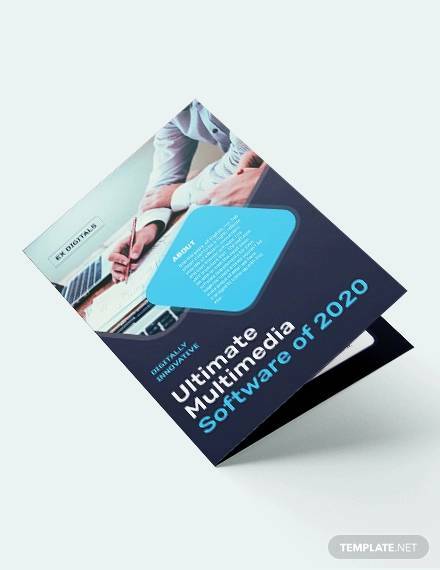 The following software brochure templates are professionally designed and they are creative enough to showcase the products or services in the most appealing way. They can also be used as catalog and pamphlet. Corporate colors are used and professional fonts are provided for content. 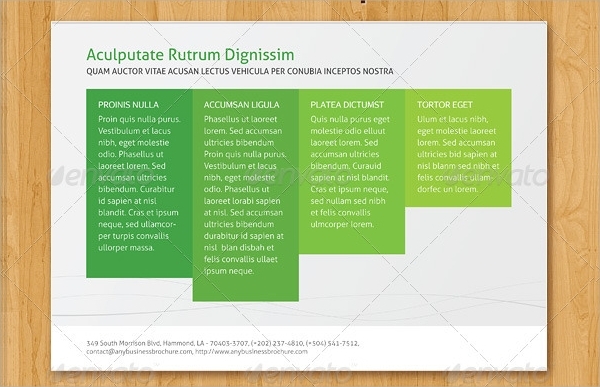 The templates are completely editable and having high resolution. 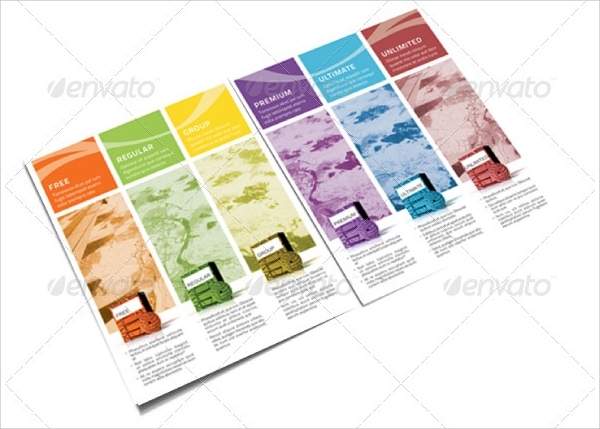 You can also see Corporate Brochures Templates. 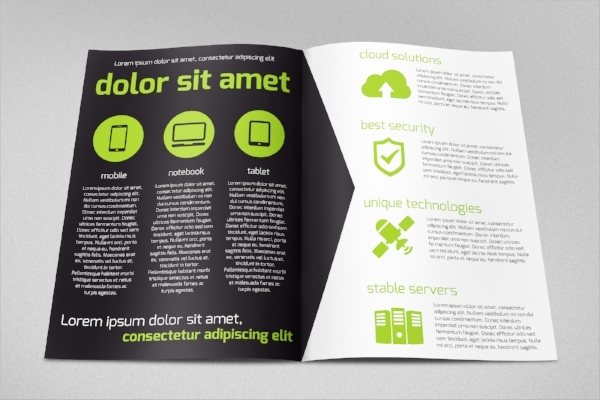 This is an A5 sized software solutions brochure template with wooden background and green and red shades of highlighters. It is available in PDF, EPS and AI file for editing and printing. It has a professional look with clean design. 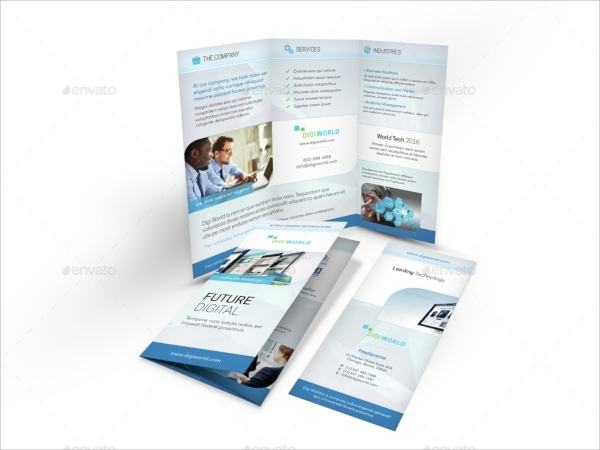 This is a professional looking brochure template for a software company with corporate blue color. 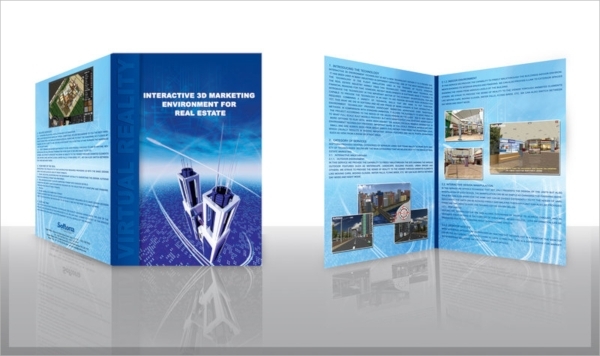 It is a tri-fold brochure and attractive models are being used to draw attention and smart objects are placed in the source file with quick editing. This is a software product catalog with 6 different color options. There are ready made tables for price and plan highlighting. It is in US letter size and the paragraph and character styles are easily editable. 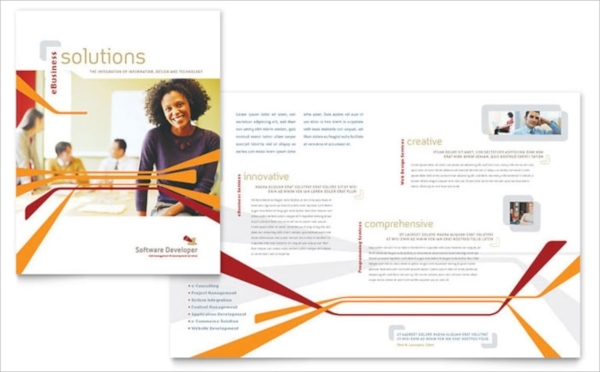 This is a cool looking A4 sized bi-fold software brochure with all the relevant icons and objects to illustration features with visual aids. It is print ready and having suitable colors and cover design. 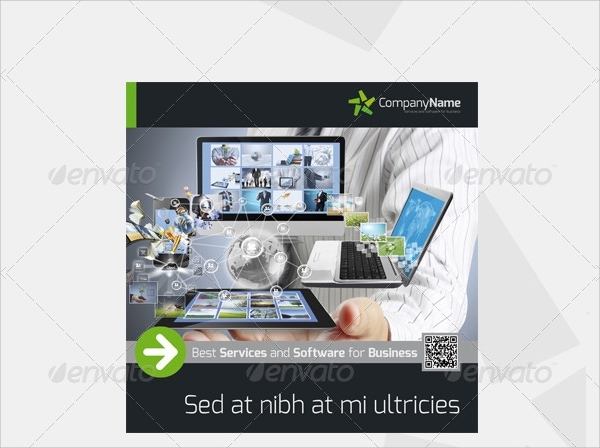 This is a green and black color combination software company template. The theme color is changeable according to the theme color of the product or company. The covers are attractive and various objects are being used such as color tables and graphs to aid in illustration. This is a worldclass CRM software brochure template with classic design that will take your breath away. The creative background design and the image placement are going to set your company apart from others. The diagrams and images and other highlighters are all eye catching. 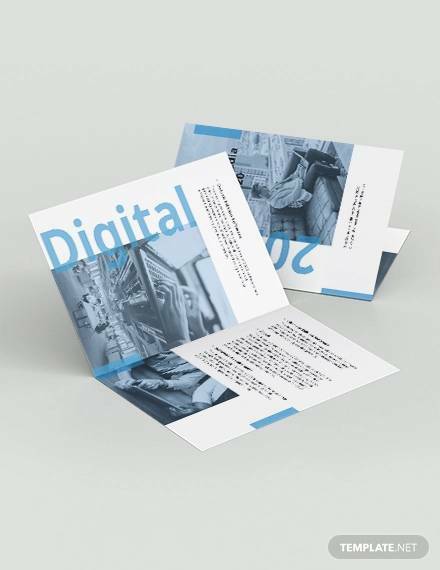 This is an A4 and US letter sized tri-fold software brochure with amazing background texture and different shades of corporate blue color are used. The layout is well organized and there are highlighters for draw attention. It is editable in all popular graphics designing software. 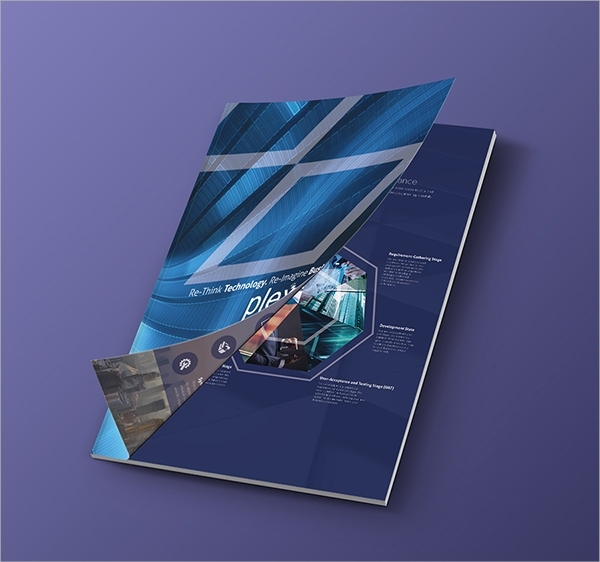 This is an innovative software brochure template in artistic shape and colorful objects. It is more like a greetings card with amazing fonts and colors being used to illustrative the latest technologies such as cloud computing. It is bi-fold and is in landscape format. 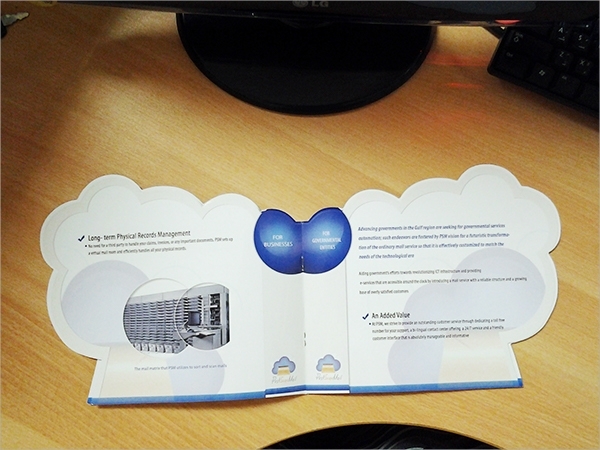 This is another IT-software trifold brochure with source file available in PSD, AI, EPS and INX format. Several patterns are provided for background and the fonts are amazing. Different shades of blue color are making it pleasant for the eyes and creative design patterns are there for highlighting content. You can also see Marketing Brochures. 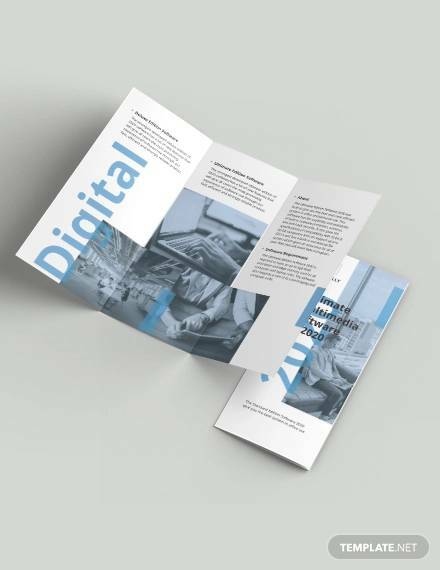 This is a clean and minimalist designed software brochure template with bi-fold layout. The background is white with 3D lines and amazing covers. There are places for logo and adding relevant images. 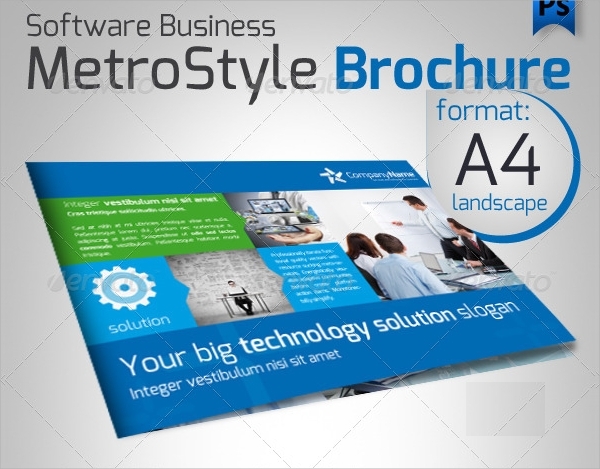 This is an artistic representation of software brochure with colorful background and has an amazing background texture. The images are replaceable and free downloadable fonts are used for content. This is an amazing metro style brochure with powerful combinations of green and blue color to highlight the entire brochure. It is in landscape format and creative layouts are provided for images. It has 4 pages with 300 dip quality and CMYK mode. 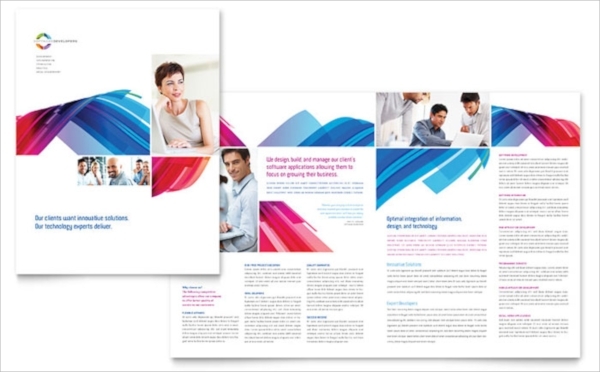 This is a traditional bi-fold brochure template with colorful patterns and relevant images at appropriate places. Different colors and fonts are used for content. It has different formats available for flyer, presentation template, letter header, business cards and much more. 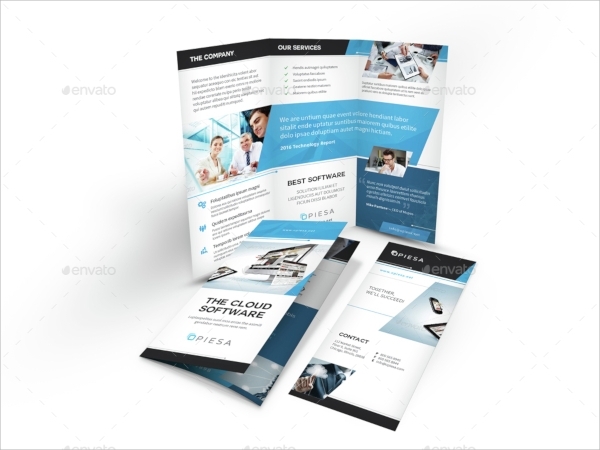 The above listed software brochure templates are stunning to look at and they can be designed as per the theme color of any company and added logo and other relevant objects of choice, to come up with an attractive and convincing layout for reaching out to potential customers and generating leads. You can also see Annual Report Brochures.